Obie award winners Jennifer Kidwell and Scott Sheppard in Underground Railroad Game. If your aspiration is to be a big Broadway star, then it is a Tony Award that you seek. But in New York’s world of more independent, experimental, and DIY theater — the so-called “Off-Broadway” realm — the top prize is an Obie Award. And on Monday night, at Webster Hall, two Philadelphia actors got the prestigious Obie honors. 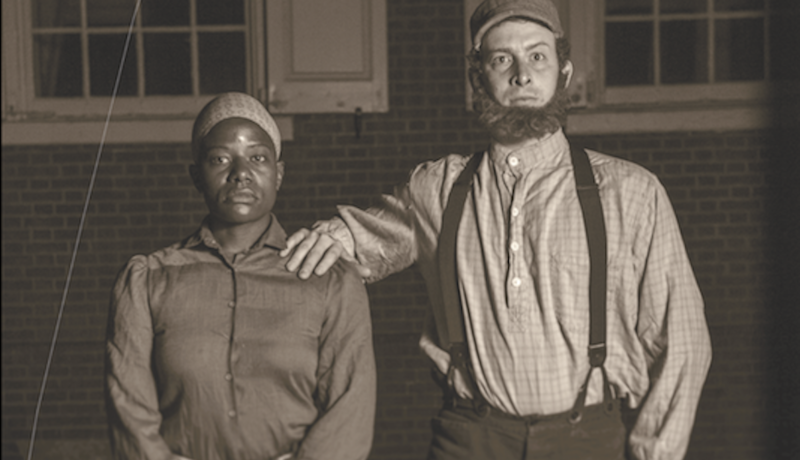 Jennifer Kidwell and Scott Sheppard were given the Obie Award for best new American theater work for Underground Railroad Game, their uncomfortably funny play about race and racism in the United States. We reached Kidwell on Tuesday morning to see how she was planning on celebrating her big victory. “I’m walking to catch the Megabus,” she told us, explaining that she’s off to State College to work with Geoff Sobelle on his new production, Home, which is one show that you won’t want to miss at September’s FringeArts Festival. Underground Railroad Game is indeed wildly entertaining, but it’s also downright disturbing, and so we wondered if she and Sheppard had noticed any negative reactions to the show. Next week, Kidwell and Sheppard take Underground Railroad Game to Hamburg for a short run, with future dates scheduled in Melbourne, Australia, Ann Arbor, Michigan, Williams College in Massachusetts, and at Woolly Mammoth in Washington, D.C. next April. And we can only imagine they’ll be getting more offers soon. Note: This story was updated with a new quote from Jennifer Kidwell. Philly Mag misheard her during the interview. We regret the error.